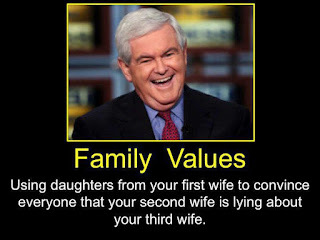 It's hard to imagine that voters in South Carolina were so easily swayed by the smooth talking Newt Gingrich. Once again, we were witness to another politician escaping public scrutiny by brandishing big words and attacking the media when a legitimate question arises about ethics and electability. I do not necessarily agree with how the question was asked, nor agree that the debate started off with this line of questioning, but in order to truly know who we are voting for, shouldn't we know the truth? A man that supposedly supports family values yet has three overlapping marriages should raise questions about his moral character. Unfortunately, this fact was lost on the voters of South Carolina. Gingrich, as in Newt fashion, effectively dodged the query by blaming others for bringing it to light, calling their actions "despicable." Failing to answer for his own despicable actions, he painted the liberal media as the enemy and somehow managed to win over the voters in South Carolina and remove himself from their cross-hairs. It almost seems that Americans, so used to the lies and deception, have lost the ability to think critically about anything. The real question should be, why should we allow a free pass to Gingrich who, after attacking Mitt Romney's "character" in South Carolina with his Bain Capital allegations, goes on and offers up disdain when his own character is questioned? This is the very definition of hypocrisy, a defining characteristic of all Republican candidates not named Ron Paul. For the average American voter, character, electability, and integrity should all be important when it comes to electing leaders. For Newt Gingrich to dismiss this question so indignantly means two things: He is right, and the media is trying to create a story to take down the poor, innocent, former Speaker; Or, he is wrong and he has something to hide. Let's examine a little of his history to see just how honest he really is. When asked about his eighty-four ethics violations as Speaker of the House, Gingrich was once again indignant and responded by saying that the congressional ethics investigation against him was conducted by "a very partisan political committee" in a way that "related more to the politics of the Democratic Party than to ethics." PolitiFact, checking his claim, rated this statement as "pants on fire," stating that "The full House went on to pass the ethics report 395 to 28, with 196 Republicans voting for it and just 26 voting against it." (here) The overwhelming support for the ethics investigation against Gingrich in 1997 resulted in his being reprimanded by the House of Representatives and fined $300,000. It also led to his eventual "resignation" from Congress. Whether it is supporting the individual mandate for healthcare, TARP funds, bailouts, or his payouts from Fanny Mae and Freddie Mac, Gingrich has been caught lying and twisting words to fool the American voter too many times. As a self claimed "expert" on history, it is ironic that he cannot even remember his own. His constant lies and manipulations could even give the king of flip flopping, Mitt Romney, a run for his money. Yes, I could spend hours blowing holes in most of the statements he has made during this Presidential run, but this article would be too long and redundant. Instead, I invite you to do a little research on your own. Remember, the media is not doing its job vetting these candidates so it is up to you to know who it is you are voting for. Please take the time to do research for yourself this voting season. America depends on it. I will leave you with a really good clip from Jon Stewart who usually calls it like he sees it.